Our lakes and rivers are stocked with trout, and salmon run up the Clutha River as far as the Roxburgh Dam in January to March. 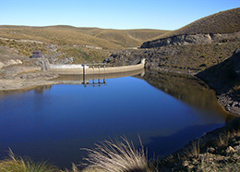 Join the fishermen and women fishing for salmon from the wall at Roxburgh Dam – it's a fishing experience like no other. The great thing about the Teviot Valley is that access to the river for fishing is easy and even experienced fishers have the opportunity to catch their dinner! Both fly fishing and spinning can bring you success if you give it a go. Lake Onslow and Lake Roxburgh are easily accessible by boat for those who like fishing from on top of the water.